A computer is fast electronic device that processes the input data according to the instructions given by the user and programmer and provides the desired information as an input. The computer evolved as a result of a man’s search for a fast and accurate calculating device. First computer is invented by Charles Babbage and thereafter many kinds of computers have been designed and built during the evolution of modern digital computers. The process of improving is continue and bringing new invention everyday. Zeroth generation of computers: - The zeroth generation of computers mainly denotes mechanical computers. Charles Baggage made first mechanical computer called ‘Analytic Engine’. Charles Babbage is known as ‘Father of the Computers’. First Generation Computers: - first generation computers are made by use of vaccum tubes. These computers are faster than mechanical computers. ENIAC was first electronic computer. These computers are very large in size and consume too much power. Second generation computers: - In this generation of computers vaccum tubes had been replaced by transistors made from silicon. Transistor was smaller in size and generates less heat. They are more reliable than previous ones. Third generation computers: - In third generation Integrated Circuits (ICs) used in place of transistors. IC is made up of hundred of transistors put on a single chip. It is small in size. It is more reliable than second generation computers. Later it is found that IC’s could be integrated on a single chip using LSI (Large Scale Integration). Fourth Generation Computers: - Fourth generation computer marks the use of VLSI (Very Large Scale Integration) in place of IC’s. VLSI allows millions of components to be packed on a single circuit. VLSI leads to development of present personal computers also known as micro computers. Computers we are using now-a-days are fourth generation computers. Only drawback of these computers is that they do not have their own intelligence. Fifth Generation computers: - Fifth generation computers is still at research and development stage. These computers will use USLI (Ultra Large Scale Integration). Most important feature is artificial intelligence. Fifth generation computers will use intelligent software and helps the computers to know ‘What To Do’ and ‘How To Do’. User interface will be provided in form of speech in natural language. “Robots” have some features of fifth generation computers. Much more will also change in future as R & D always on to improve features of computers. Send me your views and suggestion if you found any mistake in above. RSSHUGGER AIMS OF BRINGING BLOGGERS AND READERS TOGETHE IS A NICE OBJECTIVE WHICH HELPS BOTH PARTIES AND I HOPE IT WILL ACHIEVE THE GOAL OF 250000 REGISTRATIONS. THE ONLY THING WHICH I AM NOT ABLE TO UNDERSTAND THAT HOW IT WILL BRING PROFIT TO COLLIN LAHAY. I REQUEST HIM TO PLEASE CHANGE THE COLOURING SCHEME (TOO MUCH BLACK) SO THAT SITE LOOKS MORE ATTRACTIVE . In India the number of successful marriage rate is much higher than any other part of the world. The culture, tradition given from childhood makes a person able to understand the importance of relations. Mostly Indians get married through arranged marriages. Marriage is a necessary part of Indian society. Although Indian society is much affected by of westernization but still arranged marriage is most commonly used path. India's conservative ethos is so ingrained that surveys show that a majority of the young are inclined towards arranged marriages. Arrangement of marriage is responsibility of parents and other elder relatives of any boy/girl. Almost everyone in India still rely on their parents wisdom, foresight and connections to find the right person for them. Besides family, friends and neighbors many match making services, personals and now internet personals provide opportunity for people to get together. Generally social network is used for search for bride or groom who is having suitable social, communal & economic status. In case of arranged marriage not only two persons come into agreement with each other but it is merger of two families, their culture, tradition, customs and values. Husband and wife accept the drawbacks and loopholes of each other. They have some social bindings and restrictions put on them by elders of their families. Even in case of some disputes elders greatly help them to solve the issues and make their marriage life successful. The presence of elders is a very big supportive factor in making a marriage life successful. Marriage is a big event in India and brings social realignment, biological reproduction and exchange of values, traditions and wealth. At last I would say lets stick with our custom, tradition and system created by our previous generations. "Jumps the length of a football field (more than 300 feet) to set a new motorcycle distance jumping world record." In last decade roads have seen much expansion in every part of India. In urban cities four/eight lane high quality roads had been constructed on which vehicles runs at very high speed which leads to accidents. The number of accidents is increasing with every passing year. Anyone who falls on road don’t have a chance to get-up because of large number vehicles running at high speed. In India we are implementing the road and traffic system followed by developed nations without thinking and testing it is suitable for Indian circumstance and environment. Before making any bridge/road or multi-lane express way it must be analyzed and checked that some other cost effective and suitable system can be implemented in comparison to planned one. The behaviour of pedestrians, vehicle drivers (road users) in our country is not disciplined is one of the biggest problem in managing our traffic. Many rules and regulations are framed to make road users disciplined but not enforced properly. One could easily by-pass the law by giving a small amount instead of paying whole fine as a bribe to concerned staff. When we have copyied the system of developed nation we should also enforce the law according to the standard of those developed nations. Many Many Many Happy New Year to all the visitors of everymatter blog. May all of your good wishes fulfilled in the coming year 2008 and pray to God for prosperity, wealth & success for everyone. Let’s come together and make a resolution to create a fair and nice world in next year for our coming generations. Currently our T–20 World Cup winner team is in Australia to play against One Day International World Champions. On this tour the capability of Indian team will be tested on fast and bouncy pitches of Australia. Indian team has never win a series in Australia in its history. Although recently team India have defeated Pakistan team in One day and Test series in India and they have defeated kangaroos in T–20 World Cup. In last few years Australian team is much more a heavy weight team because of its numbers of victory against all teams of cricket world. My observation about Australians and Indian team says that Australians are mentally much more stronger in comparison to India. Till the last of game kangaroos don’t give up with giving putting their full effort with positive attitude. BCCI has much more resources than any other cricket board of world; even ICC (International Cricket Control Boards) income is less than the revenues of BCCI. BCCI must develop different types of pitches, stadiums and other infrastructural resources through out the country on one hand while fast bowlers, medium pacers, spinners, good batsman who have specialty to play different types of games. In short BCCI must develop infrastructural and manpower resources to made Indian team the World Leader in Cricket World. Also BCI must use its resources to bring hidden talent in various parts of country in front of whole world. At last I can say that we may hope that on this tour Indian team will win the series with its all players like Sachin, Kumble, Dhoni, Yuvraj showing good and interesting game to viewers and cricket fans. If any one of you has any ideas to make Indian team a complete winner in cricket world, please comment. Everyday we see and face corruption in our regular life. When you deal with various govt. departments you need to pay bribe from top bureaucrats to peon means pay at every stage to get your work done. The broken roads are result of corruption and understanding between officials and contractors. Health, education, taxation, administration every department is corrupted. Corruption had set its root deeply in our whole system. The biggest victim of corruption is common men. To remove the corruption peoples must be educated so that they can raise the voice. Young, educated and honest peoples should participate in politics to improve the situation. We should also use the modern tools like Right to Information (RTI) Act, E-Governance in this fight. Although E-governance has improved a situation a little bit but it is in early stage and many improvements need to be done. About RTI Actonly few and educated peoples are aware and know how to use it. The common and poor people still not fully aware about it not enough educated to complete various paper formalities involved to take benefit of RTI. Many more methods and ways need to be search out through which RTI can be implemented in a simple and better way. All of us must speak whenever and wherever we see corruption because it is our country. Government should take the steps which empower the common and poor people of country to raise voice, take action and fight against corruption. Let us take the fight against corruption in full swing. Please send me your ideas and views so that we can fight against corruption in better way. 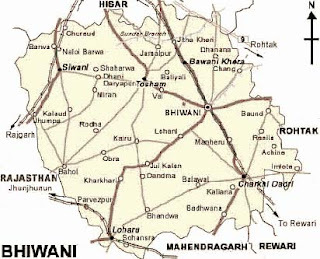 My District, Bhiwani District came into existence on July 22nd, 1972.Administrative city is situated between 28.19 deg. & 29.05 deg. North latitude and 75.26 deg. & 76.28 deg. East longitude having population of approx. 170000. Its main towns are Charkhi Dadri, Loharu, Bawani Khera and Tosham. District has also 442 villages and area of approx. 5000 sq. kms. District receives only 400 – 425 mm of rainfall. It is a city of temples and also known as ‘Chota Kashi’. The name of city had been mentioned in Ain-e-Akbari. Earlier the name of city was Bhani (Name of Rajput King’s Wife Bhani), which changed to Bhiyani and subsequently to Bhiwani. One of its important cities Dadri was founded by the son of Prithvi Raj Chauhan. By roads it is connected Rohtak, Delhi, Pilani, Jaipur, Hissar, Sirsa, Chandigarh. By Rail it is connected to Delhi, Mathura, Malda Town, Jaipur, Ferozpur, Chandigarh, Amritsar, Hissar. It is the main centre of regional politics and hometown to three Chief Minister’s of Haryana namely Ch. Bansi Lal, Babu Banarasi Dass Gupta, and Sh Hukum Chand. The known freedom fighters of District are Naki Ram Sharma, Pt. UmaDutt Sharma, Pt. Ram Kumar, Seth Gokhal Chand Arya, Lala Ram Chandra vith, Lala Noon Karan ji sore wale, Dr. Diwani Chand, Lala Mela Ram Moda who took part in 1922 Bardoli Satyagraha. Mainly Peoples of this district are engaged in agriculture. Bhiwani had given so many brave soldiers to our country during the different battles and known as City of War Heroes. Young peoples of my district actively represent the Haryana at the National and International level sports. From educational point of view Bhiwani has top most textile research institute of country named The Technological Institute of Textile & Sciences, established by the Birla Group besides it Board of School Education Haryana (Shikhsa Board) is also situated in the city. Please send me more information about Bhiwani through comments. Please send me more information regarding District Bhiwani through comments. In last one year I have come across so many online networking websites that has launched or we can say came into limelight. These sites not only provide you the facility to interact with others but also let you post your photos, music and videos. This is the new concept attracting every organization which is planning to do something on Internet. Orkut, facebook are some big and popular sites which are used by people of almost every country and working on international scale but now many companies are launching or promoting local or particular area based networking sites. Most commonly of them are indyarocks, ibibo, friendster. Some companies are providing sites for peoples of some particular interest. The biggest question on making a friend online is security. You don’t whether the profile posted is real or fake one. The other issue is that you are moving away from society, personal meeting & gathering and in future it would lead to sense breakup of relations, sense of insecurity etc. I am not against the online networking but we should also maintain our personal face to face meetings. Please post your comments regarding above. To maintain ecological balance and environment of our planet trees and plants are very important. But whenever we need land for industries, roads, residential purpose, trees, plants are destroyed which results in environmental imbalance not only in that particular area but also the whole earth environment. When trees and plants are destroyed on large scale for human needs some area is reserved for plants, trees and greeneries which is called Green Belt. But with passage of time Green Belt gets encroached by residents, industries, hawkers etc. and moreover trees fall down, plants gets destroyed because of non-care. Whether it is NGO industries, residents, industry, individual or Govt. body, no one puts any effort to maintain greenery in Green Belt. As per my observation some Area wise survey must be carried out to find the scope of plantation in Green Belt Area so that maximum plantation can be done. Some funds must be continuously diverted or reserved for maintenance of this area. Many more steps need to be taken to maintain Green Belt. Please mention your points to preserve Green Belt. Primary level education in India is not structured in a right way because generally we see that students carry a very heavy bag, water bottle, sports goods etc. they have to lift too much weight. It seems that small kids are over burdened. They have to study approx. 4 - 5 hrs. in school, complete the home work and then go to tuition. Every week they need to give test and must maintain their performance. Even for going to school they have to regularly travel approx. 10 – 20 km. All this stress is affecting the development of a child. Education must be given in a manner that leads to all-round development of child for all behavior of life not only the academic development of child. Friends if any of you have some points regarding above please mention. brown girl in d ring...: unfortunate..